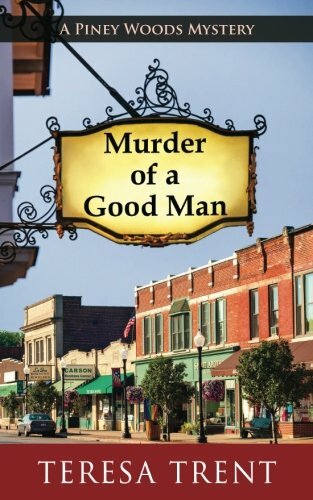 In Teresa Trent’s novel, Murder of a Good Man (A Piney Woods Mystery), her heroine, Nora Alexander, has a simple task: deliver a letter from her recently deceased mother to a man she’s never met, in the small rural town of Piney Woods, Texas. It’s a heartbreaking promise, but one she knows she must keep. What Nora expects to be a simple task turns out to be much more. Shortly after delivering the letter to Adam Brockwell, he is found murdered, and Nora is the number one suspect. Tuck Watson, the attractive police officer, advises her to remain in Piney Woods until everything can be sorted out. Nora is out of money with lots of time on her hands, and she takes up residence at a small bed and breakfast run by Tattie and Ed Tovar. In need of a job, she is hired by Marty, the owner of the old Tunie Hotel, and Tuck Watson’s aunt. As Tuck’s investigation gains steam, Nora realizes that in order to save herself, she must look for other suspects to shift attention away from her. She is not without characters: Lucy Cooper, a young African-American woman who cheated Adam on investments; Lucy’s mother, Arnett who carried a secret hatred of the man for years; Corey Brockwell, Adam’s son, who is desperately in need of money; and Delmar Dupree, an ex-policeman who partnered with the man that Nora thought was her real father. Trent brings in a variety of other characters: Max, an acquaintance of Marty’s; the Fredericks sisters Azalea and Violet, local town gossips; and Pastor Chilton, a good friend of Adam’s. In her search for answers, Nora finds more than she bargained for, learning that her mother was raised in Piney Wood, and that Nora has more family than she ever imagined possible. To Nora’s surprise, she is called to the Brockwell estate for the reading of the will, only to learn that both she and Lucy were fathered by Adam, leaving both mothers in a state of shock and disrespect, and Corey Brockwell now with two unwanted siblings. The story ramps up to an exciting conclusion when Nora encounters the true killer and motive for Adam’s death. Of course, the requisite romance begins to bud between Nora and Tuck, laying out a future partnership for crime solving. This is the first in Trent’s series set in Piney Woods, and it bodes well for the series. As cozies go, this is not only a fun read, but it moves along quite well. She has a respectable number of characters—not so many as to confuse the reader but enough to have a growing number of possible perpetrators!